12 3/4 by 16 in. This period was one in which Friant was concerned with honing his artistic skills en plein air, or painting outside rather than after models in the studio. 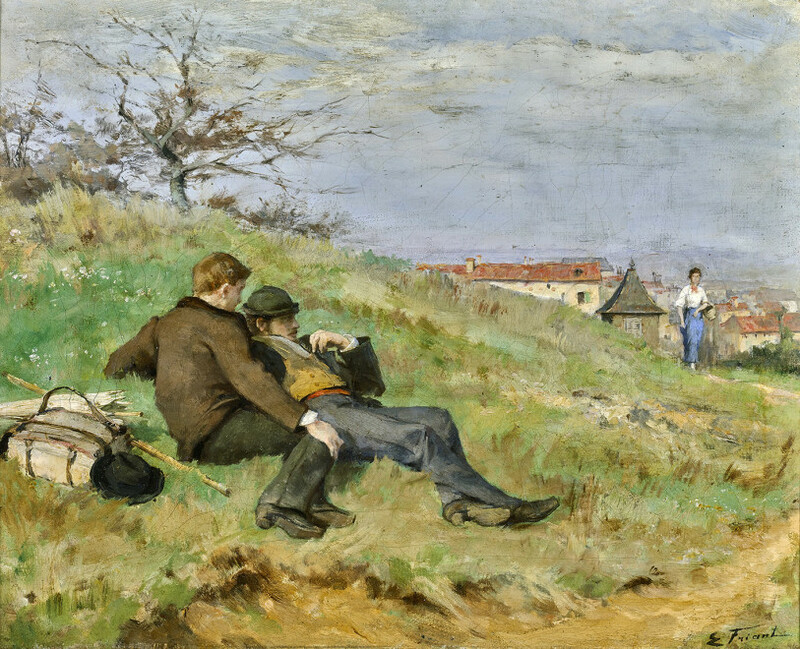 In this composition, the so-called “petit Friant” has depicted two of his artist friends, Mathias Schiff and Camille Martin, lounging on a hillock, having rested their belongings—what appears to be painting supplies, parasol, hat, and walking stick—and staring off in a moment of frozen and absorbed inaction upon the nearby red terracotta rooves of Nancy. Though the painting contains three figures—Martin, Schiff, and an incidental young woman approaching from the right background—Friant has paid little attention to articulating their individual identities, providing only schematic or obscured facial features. Instead, he has lavished the most attention on the landscape—the careful and modulated depiction of the grasses, the subtly-textured cloudscape in the bright sky, the expansion of the spindling branches of bare trees that reveal the young artist’s early fascination with painting after nature. This period was one in which Friant was concerned with honing his artistic skills en plein air, or painting outside rather than after models in the studio. 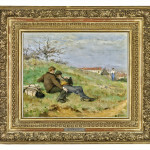 Indeed, in these years before 1880, he experimented extensively with landscapes and this work is unique for its inclusion of recognizable human figures. It was this interest in pursuing truthful depiction by painting at the motif that he learned from his first teacher, Théodore Devilly, a student of Eugène Delacroix, and in whose studio he met his friend here depicted—a formidable Nancy painter and decorator in his own right, Camille Martin. 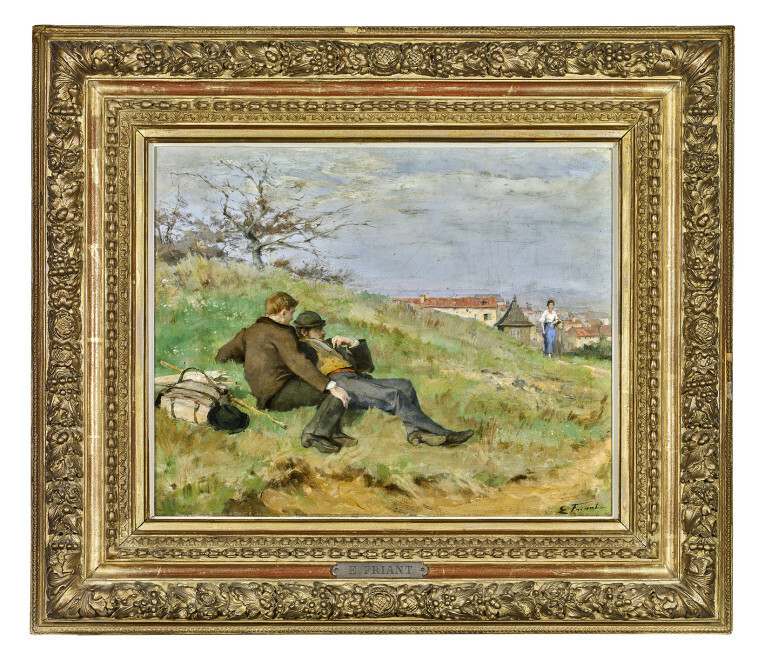 It was this “instinctive love of nature” evident in his early training out of doors that stoked his commitments to Naturalist truth and humble subjects, a commitment that ultimately led to his departure from the studio of Cabanel, as well as his eventual return to Nancy, and came to define his most successful later works. These mature paintings from the late 1880s and 1890s—depictions of rural funerals, family meals, or parties on the banks of the Meurthe river— marshalled an allegiance to depictive truth rather than abstracted brushwork and a desire to represent the everyday emotions and realities of the people of the region observed in their daily rituals. 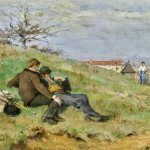 It was this interest in representing the texture of the region around Nancy—a border town that had resisted the nearby annexation by the Prussians in 1871 and that, in these first decades of the French Third Republic, experienced intense political agitation—that defined its profound and integral artistic culture. Writing in 1883, critic Claude Roger-Marx described the richness and singularity of the artistic situation of Lorraine, including in his accolades the indominable Naturalist master of the older generation, Jules Bastien-Lepage, and on equal footing he placed the promising young artists Camille Martin, Mathias Schiff, Victor Prouvé, and Émile Friant. Throughout the following decades of his illustrious career, one that would win him several national and international honors and successes on the market, Friant remained an artist equally influenced by the artistic culture of Paris and by the artistic traditions, characters, and landscape of his home in Eastern France.